Great marketing ideas for your business bombard you all the time. Your ability to capture the best of those ideas and execute them is one measure of your success. Those new promotion ideas come at you from all over. And you’re reading online right now, coming up with even more. But those ideas are just slipping away. To grab those slippery ideas, you need a system. One old fashioned way is an index card file: one new idea per card. Write down just enough to remember the idea. After every business conference, make up five new idea cards. Read business books with index cards for page markers, filling them out as you go. Carry index cards in your hip pocket. Call promising ideas into your voice mail, to write down later. Now you’ve got a big pile of index cards. What are you going to do with them? Keep the box on your desk. When you lament of slow sales or low performance, pull three cards out of the box. Pick the one idea that sounds best right now, and put it into action immediately. Put the other two back in the box for later. You don’t have to do paper, but it’s more fun than a flat computer file. I’m a fan of Evernote for storing lots of things, but I think there is something to pulling out a physical piece of paper and focusing on one idea for a moment. And you can do other kinds of ideas, besides marketing and promotion. Start a separate file for each subject. If you have one specific business subject you are focusing on learning, make an index card file for it. How do you capture and execute new ideas in your business? Nice idea. I’d love though to find an online way to do it, the best I have so far is outlook notes – not bad, but not mobile. I have 750 of them, loosely categorized into passwords, recipes, ideas and various others. There are flash card apps you could use for this for the iphone and ipad i suppose. But for me, having visual reminders is really important. Despite all my tech savvy, sometimes the post it note, index card method works equally if not better. Tim, you’ve got a great collection. If you want them online, keep one idea per “note” and make sure the system is always within easy reach to add to and to dip into. Whitney, flash card apps are a decent idea for online use. But, like you, I think paper is better for this use. However, “going analog” is always a great way to keep track of things. Pat, using photos to collect ideas could be really cool! Hi Becky, thank you for this post. I used to use 3×5 cards, but now use an Excel Spreadsheet on my desk top. The reason for this is that I come up with so many ideas – 100’s per week. The card system became too hard to manage and a little expensive. I must admit, it’s not as much fun scrolling down Excel rows compared to reviewing my 3×5 cards, but it’s vastly more efficient in my specific situation – and searchable too. Does that make sense? Robin, you have exactly the right idea: do it the way that works for you. Your brain must be really percolating! This is so timely as we start a new year, I tend to use voice recognition to document my thoughts. It is easier and my ideas flow more clearly. How do you capture all the information youn want to keep from online and other sources? Darrell, voice recognition is great! For this particular trick (having a file full of promotional ideas to pull from when you need them), it’s best to keep on idea per note, no matter what format you’re using. As for how I capture all the info want I want to save from online, I use Evernote. The more I use it, the more it pays me back. This sounds excellent. I stay away from bookmarks I carry a small pack of sticky notes when I am reading a book. I use the sticky note as a book marker every time I find something worth jotting down I write it on the Sticky note and then do the same until I finish the book. Now that I am reading more e-books I normally keep notes in the ebook and after I finish every book I go back and grab the main points. If I learned anything of value I usually update any marketing material such as presentations on the spot with what I got from the book keeping most of my presentations fresh and updated. I guess there are many electronic tools but sometimes having a tangible reminder can spark some great ideas. Raul, sounds like you have a workable system. You’re putting ideas into action or discarding them. Quite efficient. Thanks… I guess like you mentioned in your post it is about looking for something that works for you. Good point, always handy to have a few small notepads around, take one everywhere I go. 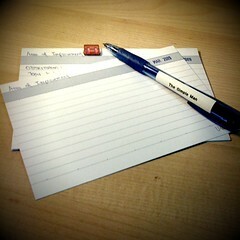 I’ve always used notecards for leads. They’re easy to flip through and encourages you to be following up if you organized them properly. My To-Do list is organized on a notepad that sits right next to my keyboard. The simple act of writing down a task gives me a greater sense of urgency to complete the item. I flag important emails so I don’t have to hunt them down and they show up under “tasks” in Outlook, but I still make a note to follow-up on my list. Lastly, I leave notepads EVERYWHERE! Next to my bed, in the bathroom (don’t ideas always come to you in the shower?! ), in the car, and on the coffee table. When an idea comes to me, I immediately stop what I’m doing and make a note of it. I have a bad enough memory as it is, so if I don’t write it down that ideas is gone! That’s my strategy. I love reading and hearing about what strategies work for others or ways to improve upon my existing strategy. Thanks for the great info Becky! Dan, thanks for sharing what works for you.